Mount Vernon Presbyterian School is committed to preparing students to be college ready, globally competitive, and engaged citizen leaders. Academic rigor remains a must, but adding a focus on 21st century skills enhances the education of our Upper School students. Rather than being passive consumers of information, we are teaching our students to be actively involved in solving complex problems, with a growing emphasis on project- and team-based learning. 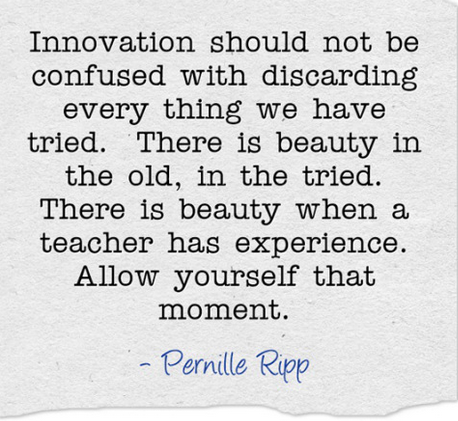 The other viewpoint is from Pernille Ripp, a 7th grade teacher in Wisconsin, Oregon. This is a link to her blog. She discusses how " We often confuse great teaching with constant innovation." Some interesting points here and well worth a read.